A smile without all its teeth — it’s a little like playing chess without your queen. You need each and every one of your pearly whites to make your smile function like it should, and when one or more goes missing, you’ll certainly start to suffer the consequences. Your self-confidence can take a real hit, not to mention the difficulty you’ll likely experience speaking, eating or smiling. But at Smiley Family Dentistry, we can help you regain your confidence by completing your smile with dental implants! Keep reading to learn more about this fantastic solution in tooth replacement from your dentist in 50677. Because nothing else replaces your missing tooth as well as its root, no other option completes your smile as well as dental implants in Waverly IA. They’re a truly comprehensive solution that increases the stability to your teeth while encouraging increased oral and overall health, too. Dental implants are small posts made of titanium, and they’re surgically implanted into the space left by each missing tooth. Over a period of about six months (during which you’ll wear a temporary prosthetic) the tooth and jawbone gradually fuse together to provide your smile with the utmost in stability. Once your jawbone has recovered from the procedure, you’ll come back to Smiley Family Dentistry for the final restoration of the implants — or when your new tooth replacement is placed on top. It’s an exciting phase which completes the entire process, and the first moment you get to see your brand new, completed smile. In order for the dental implant procedure to be successful, patients must have enough supporting jawbone structure for anchoring. Sometimes, teeth have gone missing for so long a significant amount of bone has already been lost. Bone grafting may be considered in these cases. Additionally, patients must be in solid oral and overall health for this tooth replacement option. Those with gum disease or other serious health conditions, like diabetes or HIV, are not ideal candidates for the dental implant procedure. 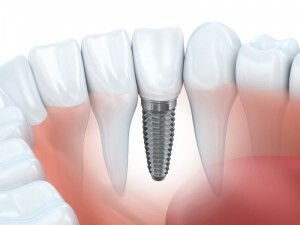 Interested in Dental Implants? Contact Us Today! If you’d like to learn more about dental implants, including whether or not they’re a good option for completing your smile, please don’t hesitate to contact Smiley Family Dentistry. Your dentist in Waverly IA is here to help you achieve the smile you truly deserve.